The Wide Brim hosta got its name because of the size, shape, and color of its leaves. Since the foliage tends to be broader, this plant typically reaches a width of 2 to 3 feet. It’s a great way to fill in a wide, open space in your flower beds. Wide brim hostas are also a striking accent for shady areas or those next to wooded areas. The wide, yellow-green border of each leaf will brighten up these dark spots on your property. 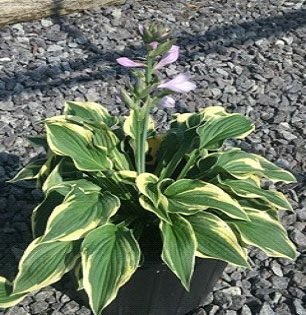 The Wide Brim hosta grows at a moderate pace and produces lavender blooms in the summer, typically from June to September. It requires regular watering (at least once a week) but keep an eye on it during periods of very high temperatures, as it may need moisture more frequently.